Below is a video from Godtube.com that you’ll want to view. 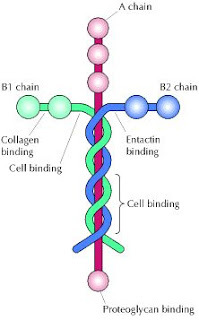 The speaker, Louie Giglio, speaks of an amazing scientific truth regarding the cell adhesion protein molecule “laminin”. Which is the “glue” that holds our cells together. It is described as the rebar of the human body—it holds us all together. Louie uses it as an awesome illustration of a Biblical truth. There is more I could share here after viewing this but you'll just have to watch the video as I don't want to give away the message. It is worth the watch! "He is the image of the invisible God, the firstborn of all creation. For by Him all things were created, both in the heavens and on earth, visible and invisible, whether thrones or dominions or rulers or authorities--all things have been created through Him and for Him. He is before all things, and in Him all things hold together." You may also want to do a Google image search using the term laminin and you'll also find some amazing pictures in outer space of pictures taken of a black hole by the Hubble Telescope. God is Amazing and may you be encouraged today at God's mighty hand as He alone holds all things together!